dairy goats, meat goats and for other purposes. These animals can breed faster and can multiply in no time. Goat’s milk is highly nutritious and tastes best when it is fresh. But first, you should know about the list of goat breeds. These are also called as French Alpine goats. They are big goats with upright ears. They are highly adaptable and available in different colors. Their milk has 3.5% of fat and they are seasonal breeders. La Mancha goats are medium sized goats of Spanish origin. These animals are quite friendly and healthy. They have very small ears that are of two types, namely gopher ears and elf ears. These animals produce milk with 4.2% butterfat and are also seasonal breeders. This miniature goat is of African origin and has ears in upright position. These animals are popular as they can produce huge amounts of milk, 3 to 4 pounds every day. They breed throughout the year and their milk has 6.1% of butterfat. This goat has a proud face, long ears and a Roman nose. These animals are highly vocal and are not heavy producers of milk. Their milk has 4.6% of butterfat and might breed all throughout the year. These breeds of goat are seasonal breeders and have some distinct black markings. They are medium in size and their milk consists of 3.6% of butterfat. Switzerland is the origin of these white goats. They have ears that stand upright. They are known to produce huge amounts of milk with 3.5% butterfat. These goats are seasonal breeders. This Swiss breed is the oldest one among the known goat breeds. The milk has 3.5% butterfat and the milk is used mostly for cheese production. These seasonal breeders are medium sized and have upright ears. This South African goat has long hanging ears and bent horns. They breed all year around and are highly popular for their superior quality of meat. These goat breeds can survive any condition of weather and breed all year. They are raised solely for their meat. The mohair of this goat is of high value as it is much softer and thinner than the wool. This makes it highly valuable, as it is high in strength, durability and beauty. The cashmere goats can yield about 2.5 pounds of fleece and shearing is performed once a year. Cashmere wool is highly popular for its quality across the world. The fleece of this breed of goat has fiber and guard hair. 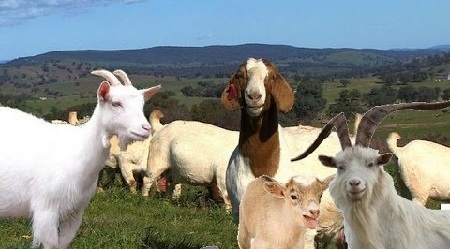 Because of such quality, it has found a place in the list of goat breeds.